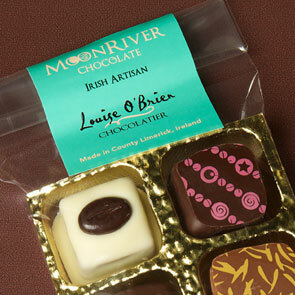 Louise O’Brien is a Master Chocolatier and owner of MoonRiver Chocolate, based in Limerick. Louise started her business in 2011. 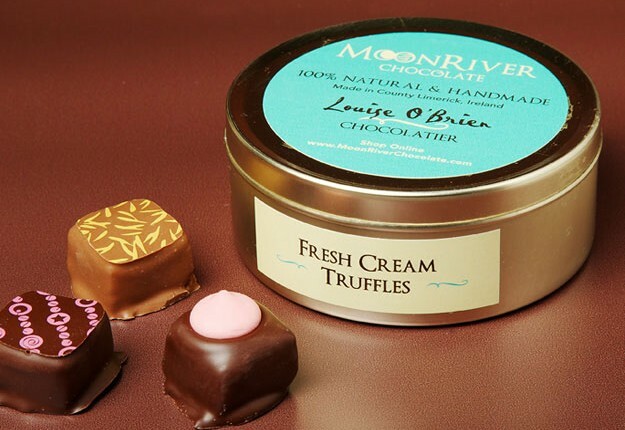 MoonRiver Chocolates are carefully made by hand in County Limerick. 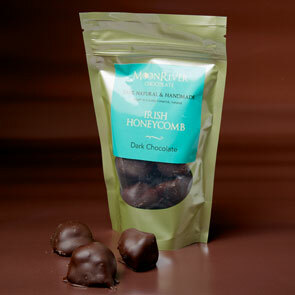 All products are 100% preservative-free and include only natural cacao bean and fats. The result is uniquely healthy chocolates that are wonderful in flavour and rich and velvety in texture. The packaging process followed the corporate identity stage. 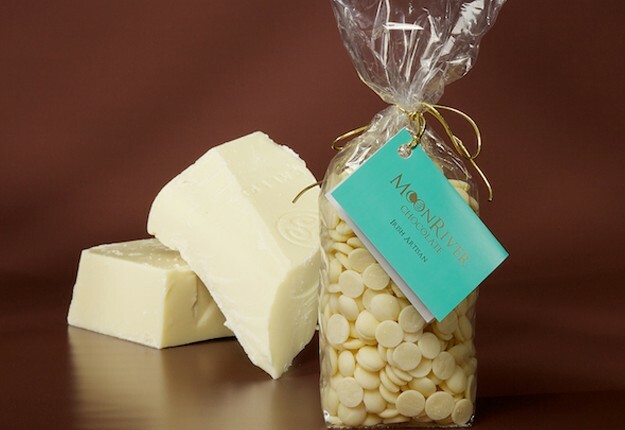 Take a look here to read about the branding process for MoonRiver Chocolate. With packaging for a product it is critical (whether the label is printed this year or in ten years’ time) that the corporate colours are 100% identical. Colours like the Coca Cola red and the Cadburys’ chocolate purple remain consistent over time and it is vital from a branding point of view to create that recognition and build on this consistently. The MoonRiver Chocolate colour scheme combines our primary colour of antique blue with cream and brown and gold foil on the tags and metallic gold on the stationery. These colours are reflected consistently across all material including the chocolate box tags, labels, wraparounds, stationery and eCommerce website. At Blink Design™, we play an important role in the management of the printing and production process. We build relationships with printers over years. In looking after us, they also take care of our clients, and importantly they understand the importance of consistency in colour and quality to the end customer. 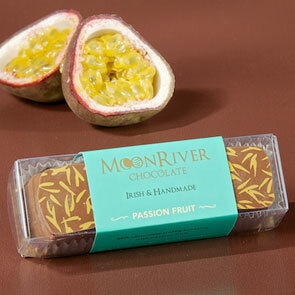 This I feel is evident throughout the MoonRiver packaging and their vast range of products and flavours. As new products come online for Louise, it is important for her to be able to print small quantities as she is constantly trying and testing products and she needs the flexibility to print in small batches. 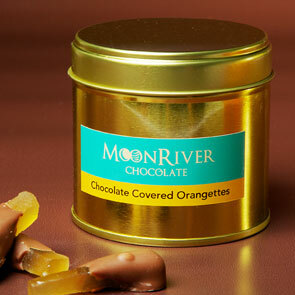 So we can even print the MoonRiver Tags with the gold foil in small or large quantities as required. The process is flexible for Louise, and she contacts us when she needs reprints, tweaks to the labels and the design of new products with different dimensions and flavours. Consistency is key for all product labels and so we work closely with Louise to incorporate the required dimensions and detail, maintaining a consistent brand story. The designs combine two font styles and always work with the corporate colours, the antique blue being the primary colour. We have also designed two colour labels that combine the antique blue and the contrasting cream. These also accommodate smaller product and keeps printing costs to a minimum. We have also since designed a secondary colour palette. 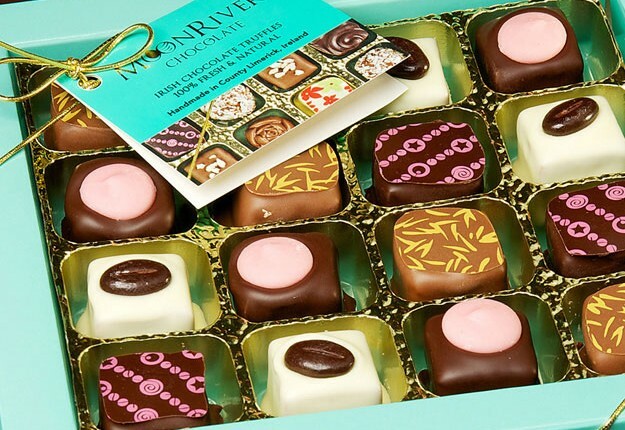 This combines a colour from each of the new flavours that Louise has created. So we now have a colour match to a specific flavour. We have been busy designing new packaging labels including tamper-proof labels. labels for gluten-free products, round labels for new tinned products and wraparounds for new bars in yummy flavours like blackberry and passion fruit, so watch this space.